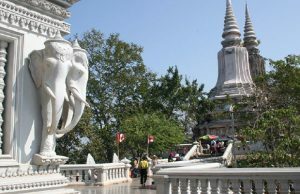 Phnom Yat is a cultural and historical site located in Pailin City. It is not a holy place where people come to worship, but also the heart of Pailin City. The mountain is 60 meters high, 700 meters long, 300 meters wide and covers 30, 000 square meters. The top is accessible on foot or by vehicle. A staircase of 242 steps, each step about 25 centimeters high, was completed on Oct 13, 1998. The site includes an old pagoda similar to Kola pagoda. It was built on the hilltop by the Kola people in 1922. The are many ancient structures on Phnom Yat, including the big and small stupas and Asroms (the hermitage, a place for meditating). 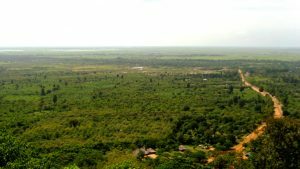 The area holds many superstitions for Pailin residents and some visitors.Although a wealth of gems already have been mined in Pailin, the hill is till believed to hold more. Many kiosks, or small cottages, are available for visitors to relax in on the mountaintop. Phnom Yat is one of the renowned historical and cultural sites that have attracted large crowds of tourists. The first thing that one notices about this particular pagoda is that it uses a wide range of and innumerable precious stones. Previously locales and passersby were the only visitors but now with the increase in the number of tourists there are more people who go to the Phnom Yat Resort, Pailin CityPhnom Yat Resort, Pailin City is especially well known for the Ko La style pagoda. Besides the pagoda which is the central attraction there is a stupa. The stupa is placed behind the pagoda. This has served as the cemetery for Rattanak Sambat, the father of Cambodian literary figure, Khun Niery. It is believed that their ashes are preserved here. There are many stories that justify the building of the Phnom Yat Resort, Pailin City. According to the legends people met a sorceress while hunting for animals in the jungle. She was called Yiey Yat or grandmother Yat and she warned them against killing her animals. If they stopped the hunting then they were promised a surprise reward near the stream on Mount Yat. The people found an otter playing on the stream. The otter opened its mouth and within it were precious gems. From pey (otter) playing or ?leng? the place Pailin got its name. Later a shrine was built to show due respect to Grandmother Yat. People come here to ask her to relive them of their pains. There is also a statue of the magic otter enshrined at the Phnom Yat Resort in Pailin City. 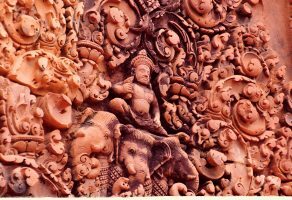 Here you will also find other statues of which depict the Buddhist hell, adulterers punished by tying them to thorn trees and also show images of the liars tongues being pulled out. 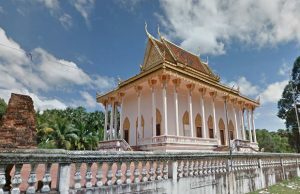 Today the shrine is counted as one of the important tourist attractions.The famous novel, Pailin Rose written by Nheck Tem gives the details of the story behind the construction of the Phnom Yat Resort, Pailin City. The story's central character Chao Chet, an orphaned poor boy came to work for Rattanak Sambat. Eventually he fell in love with the master's daughter. The father decided to marry his daughter to the governor of Sanker District (east of Battambang), named Balatt. Destitute and sad, Chao Chet played chauffer for Balatt and the bride. However, on their way their car broke down and robbers attacked them. Chao Chet, who sincerely loved the girl, Khun Niery saved her life and delivered her to her father. Impressed by the chivalry of Chet, Rattanak gave his daughter?s hand to Chao Chet.